Do you know someone with autism, Down syndrome or cerebral palsy? These are some of the better-known intellectual and developmental disabilities (I/DD), but there are hundreds more. The Arc – Jefferson, Clear Creek & Gilpin Counties is a powerful voice for all people with I/DD, working daily to create opportunities for individuals and drive systemic change. We believe deeply that all people are valued members of their communities and that the talents and contributions of people with I/DD create a better world for all of us. 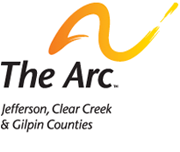 The Arc – Jefferson, Clear Creek & Gilpin Counties works for the benefit of people with I/DD by providing independent advocacy in a variety of channels. Through individualized direct advocacy, The Arc provides people with I/DD and their families with the necessary tools and resources to overcome obstacles and move in the direction of their own choosing. The goals and wishes of the person with I/DD is always at the center of our advocacy work, as a person’s right to self-determination is one of our core values. In addition to individualized advocacy, The Arc also provides a variety of trainings to increase both the knowledge and advocacy skills of participants. Each of these trainings is open to the public at no charge. Many families of young children with disabilities first connect with us through our award winning Mobilizing Families program, a multi-week training that gives families the tools they need to navigate the complex world of developmental disabilities and successfully advocate for their children. Our Life After High School training series helps high school age students and their families prepare for the transition out of school and into adult life. As people with disabilities reach the age of adulthood, our Guardianship Training helps families and caregivers address critical questions about guardianship. The Arc is committed to developing additional training to meet the needs of our community as needed. Informed by our work with individuals and families, The Arc also performs a tremendous amount of systemic advocacy to ensure that the voice of our community is represented in policy decisions that impact people with I/DD. We work directly with state and local government officials to affect policy changes in Colorado law. We also work with school districts, law enforcement, community services, and other nonprofits to help to create a stronger community that understands and embraces people with intellectual and developmental disabilities. This work has long-term impact on the quality of life of people with disabilities locally, statewide, and even nationally. To learn more about The Arc’s programs, visit the Get Help section of this web site.